The book, as the title says, consists of a series of dialogues about the Ao Naga world-view, their traditions, rituals and ethical norms, and their ideas of history and objects of veneration. The dialogue took place in specially organized meetings and participants were drawn from elders of the Ao Naga tribe, Ao Naga intellectuals and scholars, a student and a visitor from outside. The conversations that took place in these meetings were recorded and what appears in the book is a very lightly edited version of the recorded conversations. The philosophically interesting aspects of these conversations are the views expressed by various participants on the human condition, the ethical grounding of human life, the dividing line between life and death, and about their institutions for educating the young and dispensing justice. 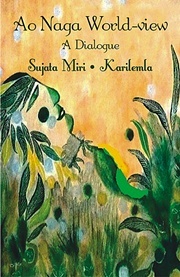 The book aims to achieve a twofold objective: (1) to secure an authentic articulation of the traditional Ao world through a dialogue between different Ao voices (an aim pursued very differently from the anthropologist’s participant observation), and (2) clearing the ground for the reflection of philosophical insights thrown up in the process of this articulation. The insights will be obvious to the sympathetic and discerning reader; the reflection is left to those who will read the book with serious philosophical interest.